Reiko Kaneko trained at Central Saint Martin’s in London and set up her business in 2007. The lack of space in London frustrated Kaneko and she saw opportunities to work closer, better and learn more from producers in Stoke-on-Trent. 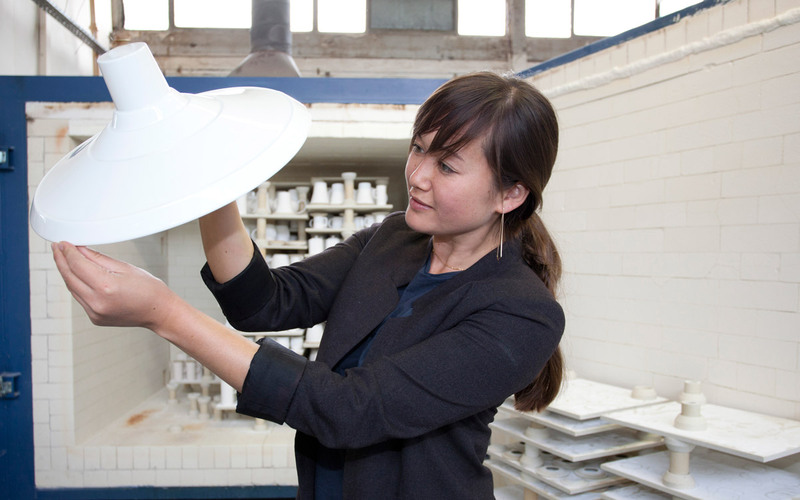 In 2012, she moved from Hackney in London to Stoke-on-Trent, the heart of the English potteries. With more space for kilns and staff, the studio now has the ability to experiment more with glazes, colour bodies and decorations. The business is now firmly rooted to ceramic cluster of Stoke-on-Trent. Kaneko is able to tap into local networks of contacts and over 200 years worth of experience and knowledge in fine bone china production. For SCP, Kaneko has created the Adderley Works and Nami lighting collections, the Terracotta and Chika collection of vessels, bowls, pitchers and platters, as well as her first furniture designs: the Orlando lounge chair and ottoman. Read more about Reiko Kaneko in the feature Habit is your greatest treasure.